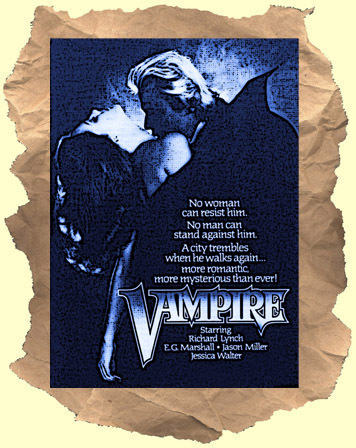 SYNOPSIS: Well regarded made-for-TV film with an excellent Richard Lynch as a decades old bloodsucker. Jason Miller plays an architect who overseas the groundbreaking for a new building. The workers uncover a treasure trove of expensive paintings and antiques as well as a sealed tomb. It turns out they belong to an ancient vampire, Richard Lynch, who wants them back. Lynch takes his fury out on Miller and his loved ones. Miller fights back with the help of retired cop E.G. Marshall. Plot wise the film can be hard to predict where it will go next and all the performances are excellent. It's easy to see why this film has a large cult following. Similar to the excellent made-for-TV "Kolchak" films (The Night Stalker, The Night Strangler), but with much less humor, it deserved to get picked up as a series. Recommended. Never released on dvd.